Green Curry Veggie Kabobs Recipe from Oh My Veggies! Something terrible happened on the 4th of July. (And for once, it wasn’t me burning myself with a sparkler. Sparklers! Why are you so hot and burny?!) Someone went into our yard and stole the rest of my blackberries. Can you believe there are people in this world who steal blackberries?! Is this the world we live in? I had finally figured out when to pick them (it’s not when they turn black, it’s when they get plump and juicy) and I was planning on picking the last batch on the 4th of July to use in a crumble, but when I went outside to pick them, there were only two lonely ripe berries waiting for me on the vine. OH THE HORROR. I can’t imagine an adult going into someone’s backyard to steal berries, but would kids really steal fruit?! Is this 1920? Did they go play marbles afterwards? And dance the Charleston? If there’s a lesson that can be learned from this, it’s that if you buy a house on a corner, put in a fence right away. Unfenced corner lot = people walking through your yard like it ain’t no thing. And stealing blackberries. So all my hopes and dreams for delicious blackberry crumbles were crushed, but I did make some tasty Green Curry Veggie Kabobs. I decided to take the lazy way out and use the pre-made kabobs they sell at the grocery store. I usually work under the assumption that pre-made = more expensive, but when I did the math, these were way cheaper than actually making my own. And look! They’re so colorful and pretty! Like a rainbow of deliciousness. And look, I didn’t have to cut any veggies! The green curry in these kabobs comes from a coconut milk marinade mixed with Thai curry paste. Green curry is fairly mild, so you can add a little heat with a few squirts of sriracha. 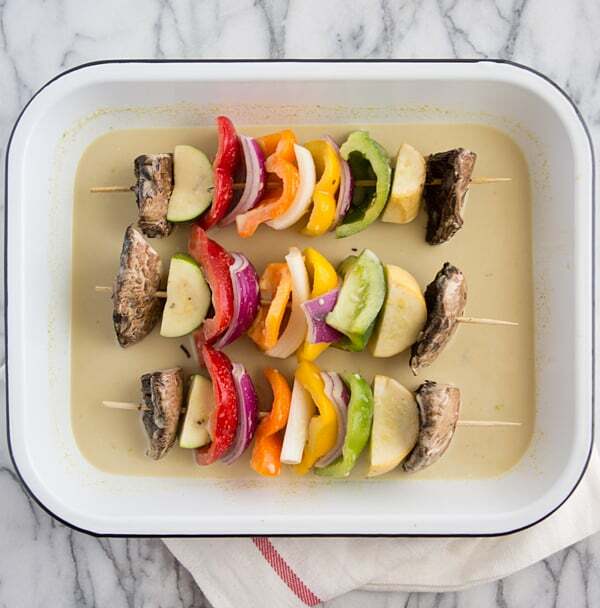 After your veggie skewers soak up all that coconut curry goodness, don’t throw out the marinade! Unlike meat marinades, it’s perfectly safe to reuse ones that have been used for veggies or tofu. We made big bowls of brown rice and veggies with these kabobs and used the extra marinade as a sauce for those. Maybe it wasn’t the most traditional 4th of July meal, but I’ll take that over scary hot dogs and gloppy potato salad any day. 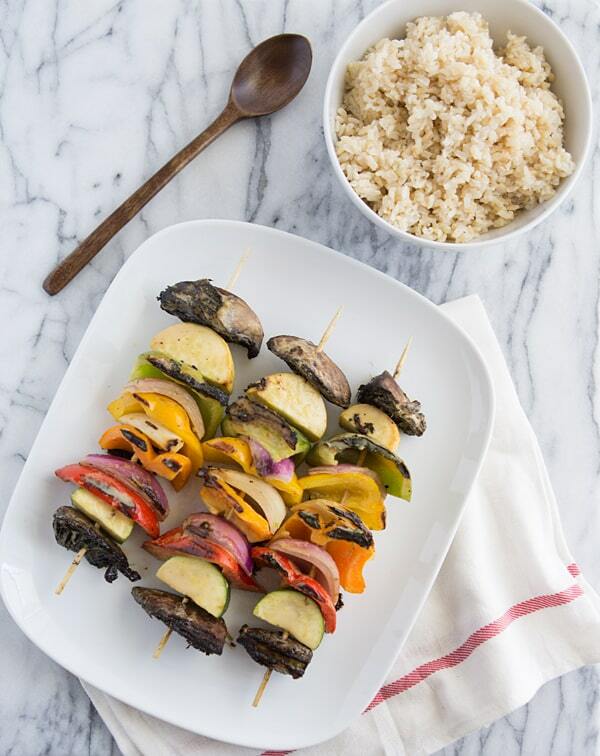 Grilled veggie kabobs made with a green coconut curry marinade. Cut the veggies into uniformly slzed chunks and thread them onto skewers. (Or cheat like I did and use pre-assembled skewers. Whatever!) If you use wooden skewers, be sure to soak them in water for about 30 minutes first. Whisk together remaining ingredients in a large baking dish. Place kabobs in the dish, cover and transfer the dish to the refrigerator, and allow the kabobs to marinate for at least two hours, up to a day. Turn the kabobs every 30 minutes or so and brush them with the coconut curry marinade to make sure as much flavor soaks in as possible! If you’re using an indoor grill, heat it to high, spray the grates with oil or cooking spray, and cook the kabobs for about 10 minutes on each side, or until veggies are seared and tender, occasionally basting with extra marinade. For charcoal and gas grills, brush oil onto the grill rack and cook the kabobs until they’re done, turning and basting occasionally. It shouldn’t be more than 10 minutes, but grills vary so much in how they cook, it’s hard to be precise. Just keep an eye on the kabobs! Prep time includes active time only. Add at least 2 hours for marinating the kabobs. I’ve been looking for veggie kabob recipes for a long time. This look so colorful and deliciouss…. Thanks for sharing and loved ur photography !! These look so awesome, I have had a hankering for green curry like nobody’s business lately!! Which I thought was so weird because I always feel like curry is a cold weather food, but now you made it a summer food and I am psyched about it!! I absolutely love green curry! This is such a great idea! 🙂 Can’t wait to try it. What a great way to use green curry paste. I love ideas like this; they allow vegetarians/vegans to enjoy barbeque/cookouts as well! It would be nice to think a very intelligent and stealthy animal stole your blackberries, but either way they’re still gone – that’s terrible! At least your meal sounds like a success – love the flavours you infused into your kabobs! We had some kind of animal picking at the blackberries a little bit, but I think this was a person because they were picked clean off the vine. It was a little suspicious! Those look delicious and so summery! What a great way to avoid turning on the oven! Green coconut curry marinade?! So so yum!! I really need to cook more with curry – it’s like pesto, every time I have it, I think, this is SO good! And can I say your pictures are just incredible?! I love curry paste. You can throw a tablespoon or two into so many things and it adds such a great flavor! This post certainly makes my mouth water…looks so yummy! Great photos too. One of the things I miss most in the summer are hot curries…this is a great way to get that flavor without a heavy meal of curry / rice! Love it! These look delicious! Unfortunately, I only have a George Foreman grill…do you think these would work on that? Would I do 10 minutes total since it cooks both sides at once? I think the George Foreman would work, but you’re right, it would probably take a little less time. I’d just check on them often and take them out when they’re done! Brilliant! How have I not thought of this before? 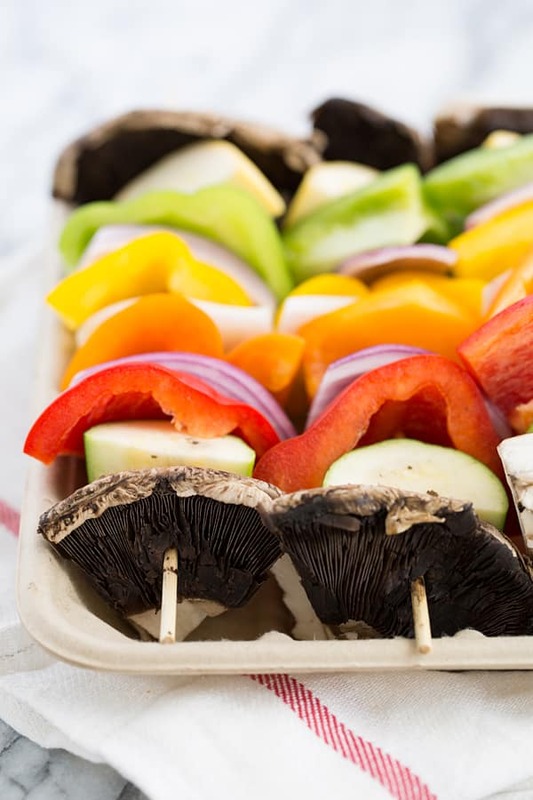 And the photo of just the veggie kabobs raw is one of the most stunning shots I’ve seen on Oh My Veggies, stopped me dead in my tracks. LOVE IT! Pinned for inspiration. And yes, this is the world we live in.